← Comment by Linda Rebholz on the “TOC”. With the Beautiful ‘Backdrop’ of the Golf Lakes Shuffleboard Club, the SWCD Masters displayed the ‘Best of the Best.’ The format in the SWCD Masters parallels the FSA Masters, with three & a-half day, 3 games per opponent competition. Also, ‘Skill Shots’ take place at the end of ‘each’ match. Total scores from these Skill Shots are used as the ‘tie breaker’ for for final places (1 thru 8). 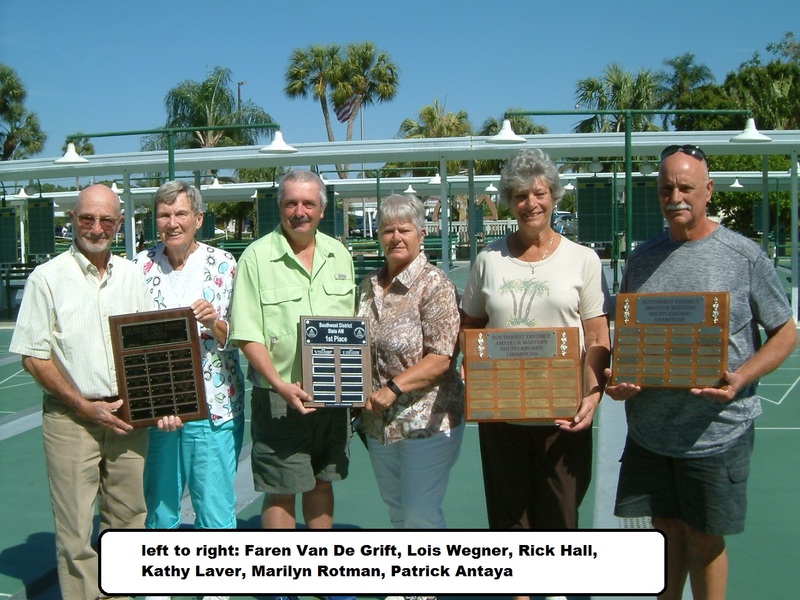 It adds ‘A Touch of Excitement’ to the SWCD Masters Tournament. LEFT TO RIGHT: PRO WINNERS; STATE AMS; DISTRICT AMS.